Robert C. Hutchison | Thompson Warner, P.A. An East Coast transplant, Eagle Scout, and Navy brat, Robert is a graduate of New College of Florida (B.A. 2003) and the University of Florida (M.B.A. 2009). He worked as a Senior Claims Adjuster for Progressive Auto Insurance, conducting field inspections all over north Florida, investigating fraud, and settling property and injury claims. While at Progressive, he was also involved in a corporate review of the company’s estimatics and total loss software and processes, he aided in handling catastrophic claims events like hurricanes, blizzards, and hail storms, and he was routinely involved in intercompany arbitration proceedings. After five years with Progressive and getting his M.B.A., Robert went to law school at the University of Notre Dame (J.D. 2012). For two years, he was Prof. Lisa Casey’s research assistant on a range of matters related to corporate law, including the passage of the Dodd-Frank Wall Street Reform and Consumer Protection Act and U.S. Supreme Court approaches to corporate law cases. He also assisted in the research, drafting and editing of a textbook, Corporate Governance: Cases and Materials, which is used in law schools across the country and has been cited in law journals and in a brief to the United States Supreme Court. While in South Bend, he was Executive Editor of the Notre Dame Journal of Law, Ethics & Public Policy, overseeing the publication of a scholarly volume on corporate governance that featured articles by former Attorney General John Ashcroft and former Chief Justice of the Delaware Supreme Court Myron T. Steele. While working with the Notre Dame Law Clinic, he successfully mediated over a dozen divorce, child custody, and property disputes. After law school, Robert was a Staff Attorney for two-and-a-half years at the United States Court of Appeals for the Eleventh Circuit in Atlanta. While at the Eleventh Circuit, he advised the court on the disposition of over 150 civil and criminal appeals touching nearly every area of federal law, including all manner of criminal prosecutions, civil rights, employment discrimination, and immigration. At the end of his extended term, Robert followed his now-wife to the Sunflower State. He accepted a position at the Kansas Supreme Court, where he advised on petitions for review and made case recommendations for both the Kansas Supreme Court and the Kansas Court of Appeals. Robert joined Thompson Warner, P.A. in October 2016. Since joining the firm, Robert has already conducted a full jury trial and is applying his considerable federal and state appellate court insider experience to litigation on behalf of our clients. He has handled cases involving, among other things, insurance coverage questions, and real estate fraud. 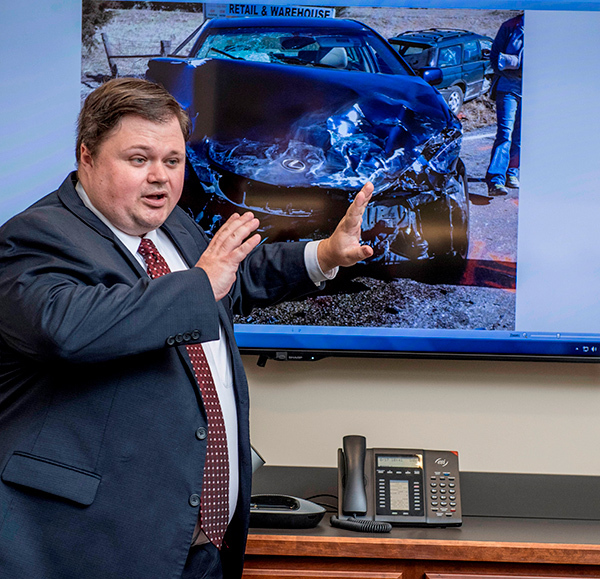 Robert authored the article An Updated Review of Uninsured and Underinsured Motorist Law in Kansas for the Summer 2017 edition of the Kansas Association of Defense Counsel Journal. Member, Board of Directors of Independence, Inc.